Well, Chris really conjured up some magic on her Asian Pears (I mean Pears Asian) when I think of the beautiful purple under painting she did. You must take a look at that sneak peek because it looks like the finished painting to me! This really was a challenge for me painting soooooo small! 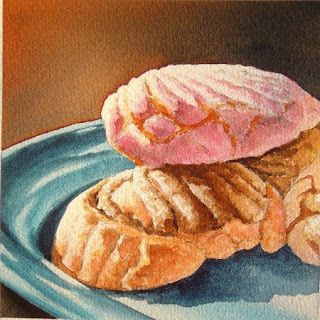 (and not eating the pan dulce before I could paint them) I don't know what it is about painting small that I can't seem to get the feel for. For all the details I tend to put into a painting, I really do love to slop on the paint and push it around and watch it do it's thing. As always, your work continues to inspire, and it's great to see you engaging in Challenges! AS ALWAYS, amazing works!BRAVO ! 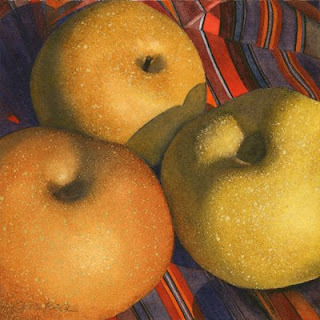 Beautifully painted - and I bet they tasted as good as they looked. I love that you and Chris are doing challenges! Inspiring from both of you as always! I like the close up compostions.